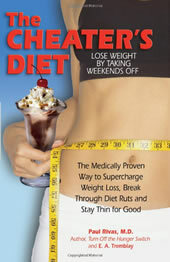 The Cheater’s Diet is written by Dr. Paul Rivas, an obesity specialist who has helped over 15000 people to lose weight. He claims that his program addresses the main factors that are important if dieters are to be successful at losing weight: keeping the metabolism high and avoiding dietary boredom. Rivas says it doesn’t matter whether you cheat on your diet or not, but, how often you do. The Cheater’s Diet involves a low calorie diet with a high level of physical activity during the week. Dieters can have the weekends free to indulge in their favorite high calorie snacks and treats. During the week dieters consume three small meals and two snacks, which has the effect of boosting metabolism. Rivas recommends that dieters adhere to a Mediterranean style of eating and monitor portion sizes carefully. Rivas states that increasing calorie intake over the weekends serves the purpose of further stoking the metabolism, avoiding the reduced fat burning that typically occurs on low calorie diets. The body doesn’t go into starvation mode, which ensures that weight loss continues even when dieting for long stretches at a time. Essential to the success of this plan is the concept of ‘controlled cheating’ where dieters may indulge in their favorite treats but still with some restraint. For example a piece of chocolate cake is fine, but not the whole cake. This allows dieters to enjoy these foods without feeling guilty and can make it easier to stick with reduced calorie diet during the week. Many supplements are recommended, however, Rivas states that they are not essential in order to experience success on the program. Lean meats, whole grains, seafood, salads, berries, olive oil, nuts, low fat yogurt, and protein bars. Dieters are encouraged to be as physically active as possible during the week. Rivas recommends activities such as walking, washing the car and gardening rather than going to the gym. These home exercises can be used with the Cheater’s Diet. The Cheater’s Diet retails at $18.95. Allowing more freedom on weekends may help with maintaining motivation to stick with the plan over the long term. Includes a balance from all the food groups. Uses the plate method for effective portion control. May help dieters break the cycle of yo-yo dieting. Includes two weeks of meal plans and recipes. Calories are not adapted to suit the individual and will be too low for most men as well as physically active individuals. Lack of references to scientific research for claims made regarding the metabolism boosting effect of cheating on weekends. Makes some dubious statements such as that the cinnamon in cinnamon buns is beneficial for blood sugar management and that peanut butter and chocolate will boost metabolism. Nutrition information is not provided for recipes. Encourages the intake of artificial sweeteners. Recommends supplements that have not been proven to be effective for weight loss. The Cheater’s Diet may be beneficial for dieters who struggle to maintain a strict diet over the long term or those who give up on a diet completely with the first sampling of a forbidden food. Dieters can indulge in their favorite foods without feeling guilty and thus avoid the feeling of failure that often occurs when a diet is not followed exactly as prescribed. For this type of dieter there are profound psychological benefits associated with this style of eating that may greatly increase the likelihood of long term successful weight loss. This WORKS! Have trained myself in this manner giving myself leniency on the weekends and I’ve not felt better in a long time. It’s common sense to me. I like the information provided.